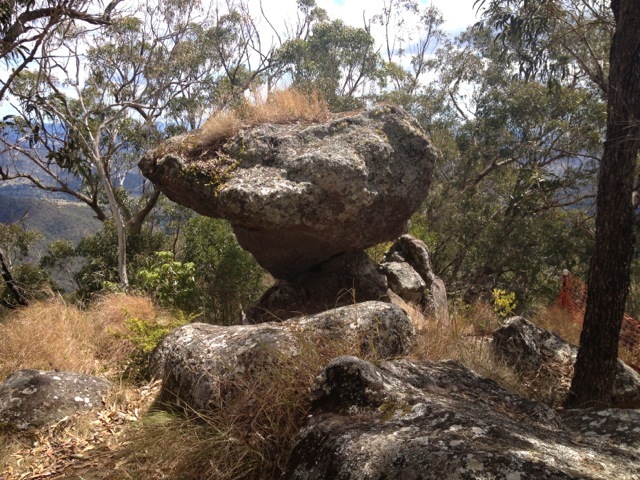 Mt Barney is a pair of peaks on the border between Queensland and New South Wales. 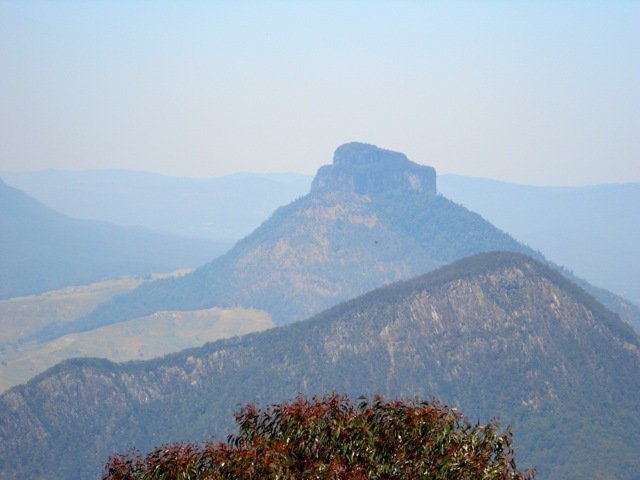 It’s the third tallest mountain in South-East Queensland. While it’s only 1354m above sea level – a molehill compared to many of the world’s mountains – it’s up there by Australia’s standards. 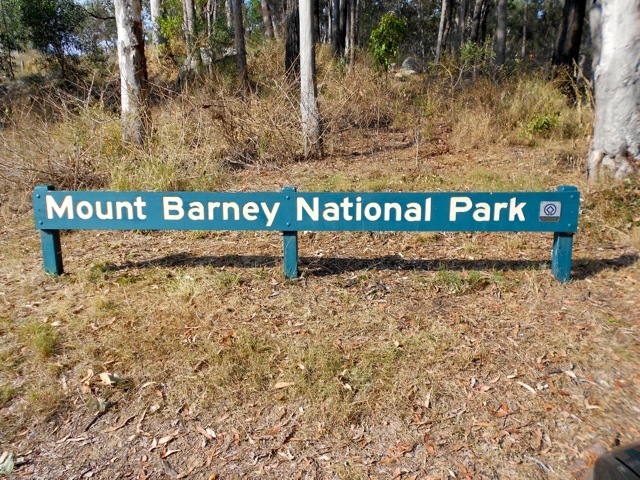 For my last outing with my hiking group before I leave Queensland I arranged to climb the lesser known trail up Mt Barney’s South-East Ridge. The South Ridge is the more common way up for this trip will be our descent. The South-East Ridge is more difficult as it’s steeper and more exposed in several places. 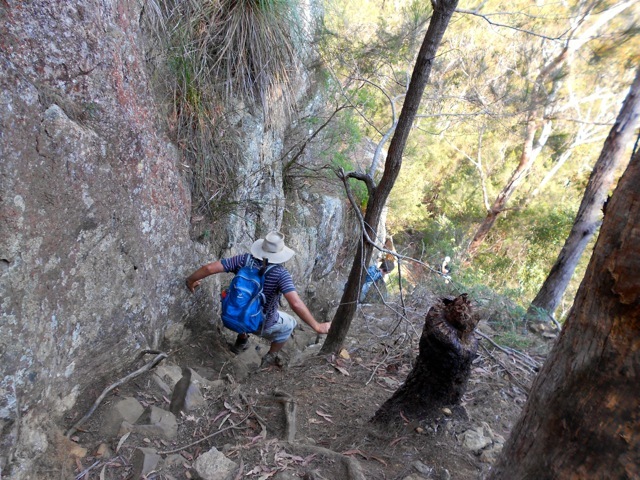 Mt Barney – South East Ridge to South Ridge Circuit – 16.5km – 10 hours – difficulty: very hard. The hike has an estimated 10-hour length, so I arranged for the group to meet at 6.30 a.m. outside the information booth in Rathdowney. With 7 of us in attendance, we drove to the car park at the base of the mountain. Thankfully the signs confirmed where we were supposed to be, as the mountain and most of the area was shrouded in low cloud. A bit of a contrast to the fact the temperature was supposed to rise to a muggy 30ºC today. The car park is about 3.5km from the beginning of the South-East Ridge trail, along a dirt road that works its way towards the mountain by crossing a couple of small hills. 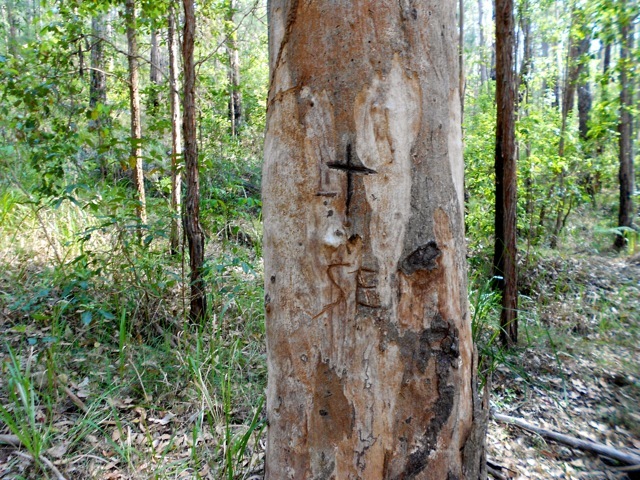 There is only one way to find the South-East trail, the letters SE carved into the trunk of a tree beneath a cross. What the cross means I’m not sure, perhaps an ominous message left by previous climbers? The thin dirt track began at a gentle slope but grew steadily steeper as it worked its way towards a rocky spire. At our backs as we climbed, the wedding cake topped Mt Lindsey and for much of the morning, cool breezes flowed from the east. The climb was anything but easy, and the 7 of us stopped regularly, usually when the ridge came to a flat area every 100m or so. The trail changed constantly, moving between dirt and root steps, to rocky steps cut from sheer gullies with plentiful handholds to smooth rock scrambling. 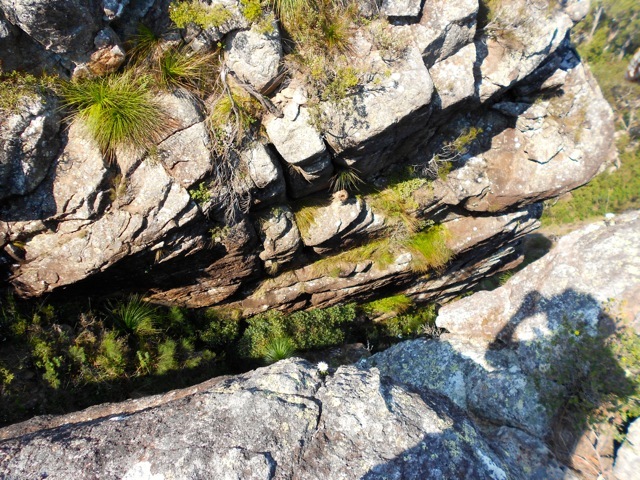 At the top of the short flat areas we often looked down on something different, a sheer cliff face here, a long rock gully there or down on top of a mini forest. Each time we’d scramble up to the top of a ridge we’d find the great spire of the next one staring down at us. This gave the sense that the mountain just keeps going, on and on. But eventually we climbed over a ridge to find we’d run out of mountain. 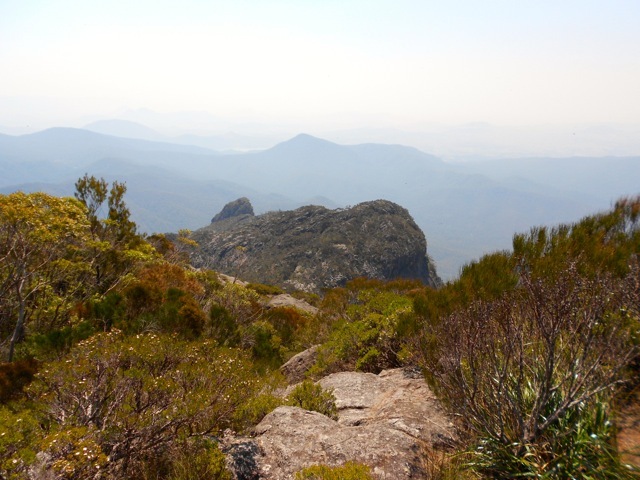 The top of the Eastern Peak is an open rocky area giving us a total 360º view. Unfortunately, because of the early November heat the views from the mountain were hazy. The heat also brought out many bugs that seemed to dance in the air around us. They seemed quite attracted to the smell of our sunscreen as we reapplied. We stopped for lunch before heading down a vague trail that led towards the saddle between East and West peaks. We climbed down flat rocks with the rocky spire of the more difficult West Peak ahead of us. Thankfully for grippy hiking boots the decent wasn’t difficult and we arrived at the saddle in short order. 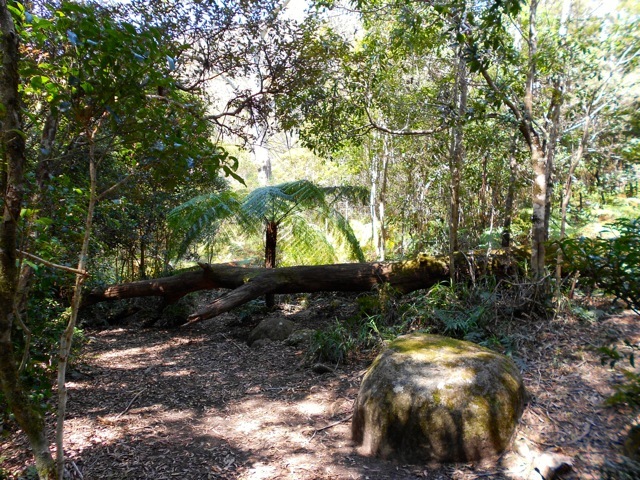 The saddle is a small rainforest and has a space set aside for camping. The South Ridge trail, also known as Peasant’s Ridge, was more difficult than the ascent of the South-East ridge. While it wasn’t as arduous, it was far more humid, with the trees hiding not only the sun, but easterly breeze as well. This meant our descent was in the full humidity, so it was hot and uncomfortable. Eventually, we made it to the bottom and headed towards the car park. This was perhaps the hardest part of the day. After climbing the mountain, we were hot, tired and sore. The four kilometres of dirt road just seemed to go on forever and the two small hills we’d climbed at the beginning of the day seemed each as tall as Mt Barney itself. Finally, eight hours after we began we made it back to the vehicles, then it was back to Rathdowney for a well-earned beer. 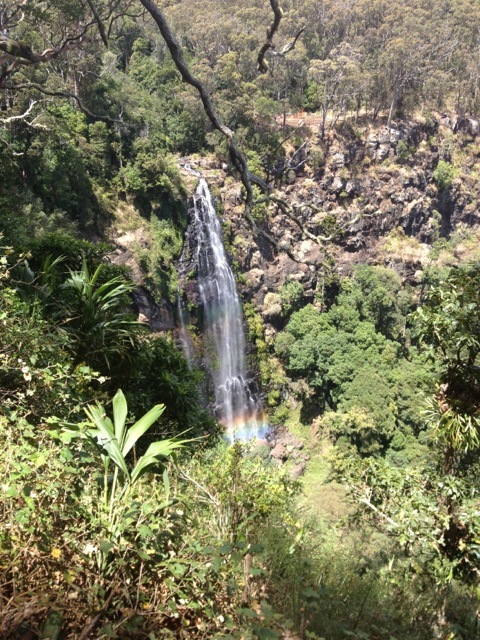 An excellent final hike in Queensland. 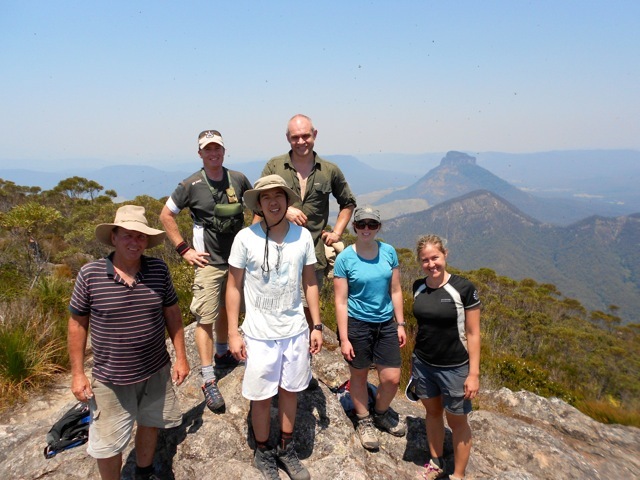 This week I took my hiking group into the Green Mountains section of the Lamington National Park. 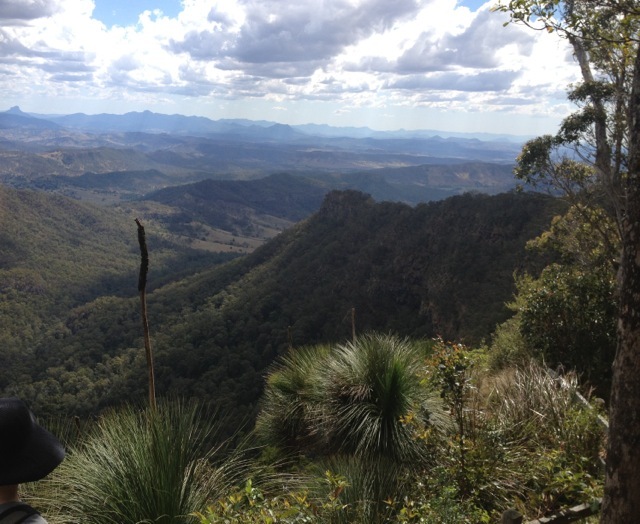 I’ve done several walks in the Green Mountains including the Gold Coast Hinterland Great! 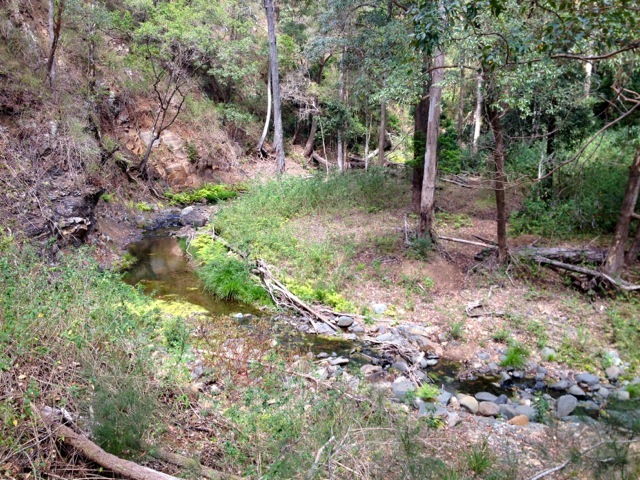 Walk and the West Canungra Creek Circuit. There are many walks in this national park and I was looking for a less intense one for the group. Getting to the start of the hike was slow along the thin winding roads where some drivers could have gone faster if they got out and pushed. Eventually, my intrepid band of 14 set out along the road heading towards Moran Falls. This particular hike mixed a couple of circuits and included a section off-track. 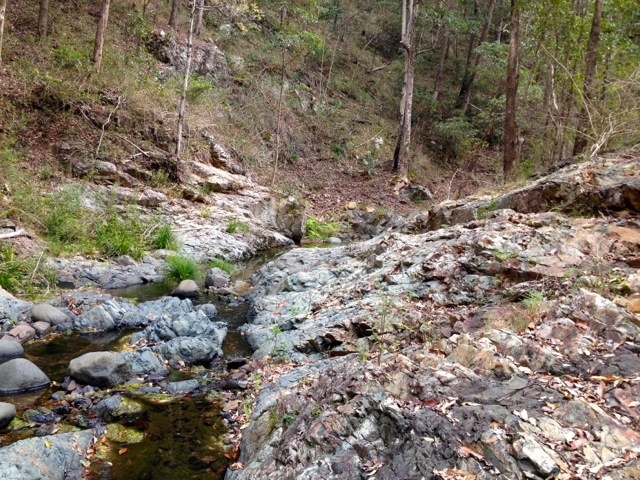 We left the road and headed along a cemented track down the hill for 2km to the Moran Falls Lookout. At the time of writing it hadn’t rained much in Queensland for a few months, so I was hoping there would be some falls to see. But as we came to a viewpoint across from the falls, we weren’t let down. 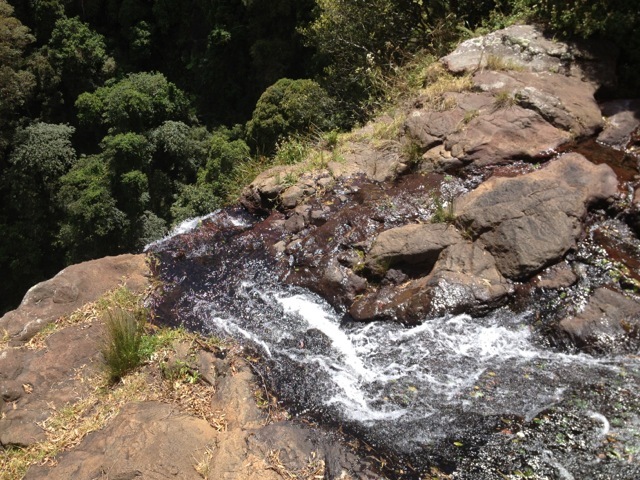 The Moran Falls drop 80m to a small pool and was a pleasant view so early in the hike. From the falls, we continued around the top of the cliffs buried in trees to a bridge across the creek flowing to the waterfall. …to an open area of rock at the top of the falls where we could stand on the rocky ledge looking down to the base of the waterfall and along the valley. 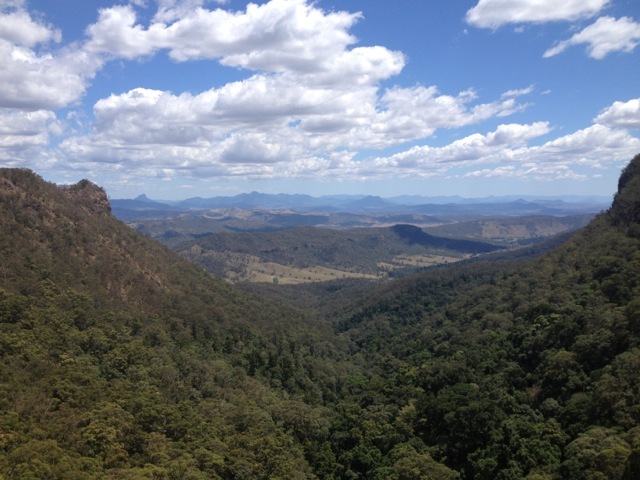 In the background is the mountainous Scenic Rim including Mt Lindsey, Mt Barney and Mt Maroon. While we hadn’t walked far, we decided to stop for lunch. After lunch, we continued along a steep dirt track up a hill. This was perhaps the most difficult part of the day and during this time the group began to break into faster and smaller groups. We continued following the path along a ridge until it opened up on one side to an unnamed lookout. The views of the next ridge were great, as was the tree-lined valley between the two. We continued along the ridge until we came to the Balancing Rock. It had been cordoned off, so we resisted getting too close. Beside Balancing Rock the track continued along a more precarious part of the ridge. The group stopped at the lookout as two of us continued along the ridge to a protruding crag at the end called Castle Crag, with views in most directions. 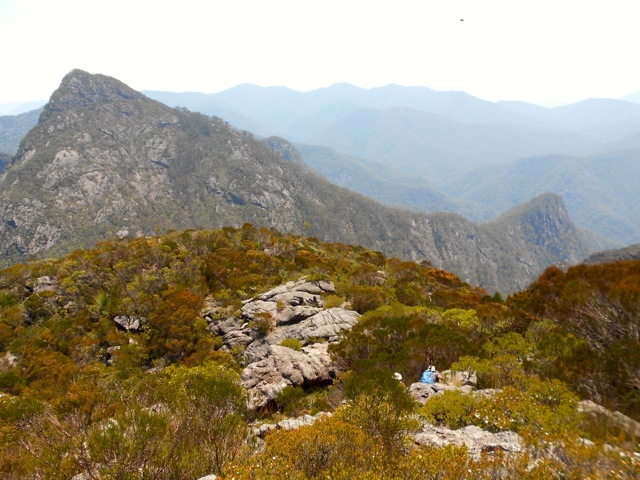 Returning to the group and we continued up another steep dirt road to a large clearing and along a short boardwalk to Moonlight Crag – a large wooden lookout giving us again great views of the mountain ranges and Castle Crag. 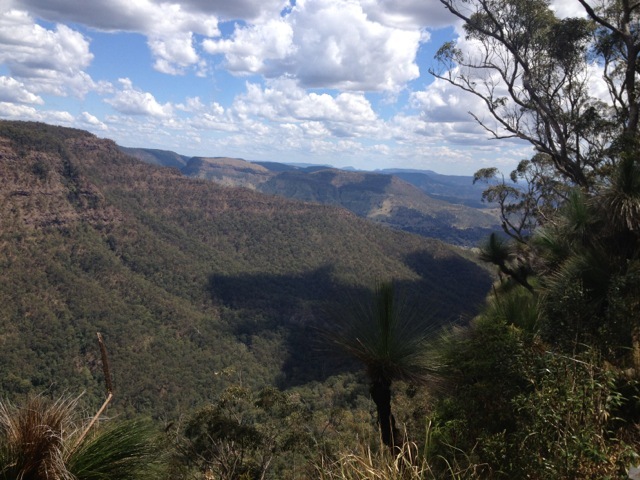 …and then on again towards Lyrebird Lookout. Unfortunately, the sign to the lookout wasn’t prominent and we went past it to an open clearing that held the foundations of several buildings from decades before. It was unclear what these buildings had once been used for. 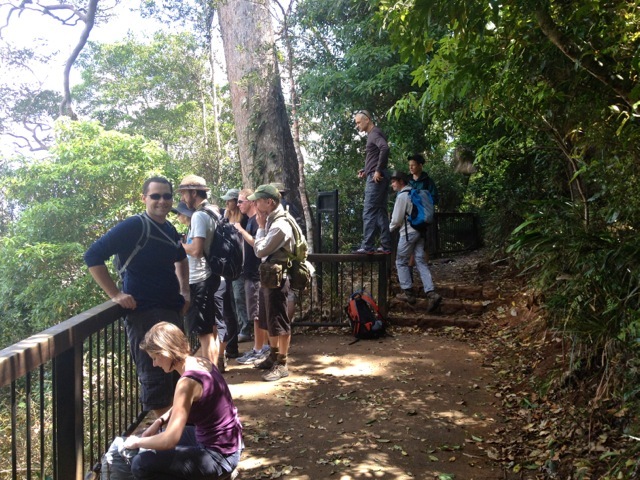 We waited for the other group but when they didn’t arrive, headed back along the trail, making our way through the rainforest to an overgrown track and on to a well attended track. A kilometre further on we arrived back at the start point and waited for the second group to arrive. They weren’t far behind, having found Lyrebird Lookout and returned a different way through the rainforest back to the start point. In 1955, an RAAF Lincoln bomber flying a sick baby from Townsville to Brisbane went down in bad weather, crashing 50m from the top of Mt Superbus. The sole survivor of the crash was a ginger Kelpie. This week, I took a small team from my hiking group to climb Mt Superbus and find that Lincoln Wreck. This hike wasn’t going to be easy and it wouldn’t help that it was forecast to be 33ºC and muggy or that all we had was a sketchy set of instructions. As the trip to the beginning of the hike was a long way from our meeting place, I camped out in my van the night before. It certainly made the early start the next day a little easier. The meeting point is the usual spot, Aratula BP, an hour outside of Brisbane. The hike starts a further 80km into the Main Range along a dirt road with a couple of stream crossings, which could have been more of a hazard if it had actually rained in Queensland over the past months. At one slightly deeper crossing, we were forced to leave half of the cars behind and pile into my van for the last several kilometres to a pleasant looking farm. Through the gate, we headed along a dirt road which we believed was the beginning of the hike. But after following the dirt road a couple of kilometres we finally discovered a National Park sign and a thin trail that was the actual start point. We walked through overgrown rainforest for about two kilometres following the thin trail, slowly working our way uphill. Sometimes we taller walkers were forced to crawl to follow the trail. At some points along the hike we followed pink ribbons attached to trees, but mostly we followed the vague trail. About an hour in, however, the trail petered out and we were left without markers in the overgrown rainforest. And being immersed in trees, there were no reference points, not even the mountain we knew was there. Our instructions directed us south east, so with compasses out, we headed off-trail in search of a more obvious trail. As we walked we found a downed tree across the gully like a bridge. We then climbed a wet gully, continuing south east. At the top we located the trail we’d been looking for and followed it. While unsure exactly where we were, we stopped for lunch before continuing along the trail, following it deeper into the rainforest. The trail ended abruptly at a rocky gully and we discussed our options. It was 1.30pm with sunset due at 5.45pm. We’d been walking nearly 3 hours, so we had to judge how long push on before turning back, allowing ourselves time to return to the vehicles before sunset. After a search around the bottom of the gully, we located a tin arrow nailed to a tree, a marker mentioned in the instructions! We decided to follow the arrow and it led us up the rocky gully. 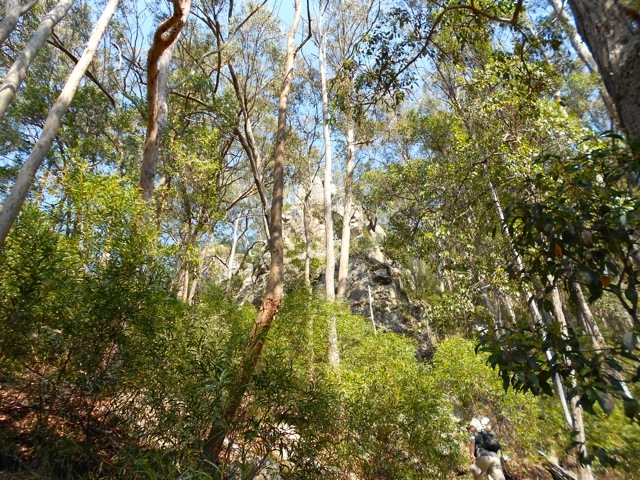 The rocky gully climbed upwards rather steeply, occasionally forcing us to climb short cliffs and avoid both stinging nettles and Gympie Gympie plants, touching either is not suggested. We scaled a large fallen tree trunk, which posed more of an issue for the shorter legged members of the group. At the top of one short cliff we located the bomber’s engine block. This prompted us to continue climbing. A little further up we were distracted by some pink markers that led us nowhere, so we returned to the gully and continued climbing. Eventually after a series of intense scrambles, we found the bomber’s fuselage wreckage, a solitary wing and a mess of other metal. We stopped for a short break before beginning the long journey back to the vehicles. We would have liked to have continued to the top of Superbus, but with the short winter days, it was best not to. 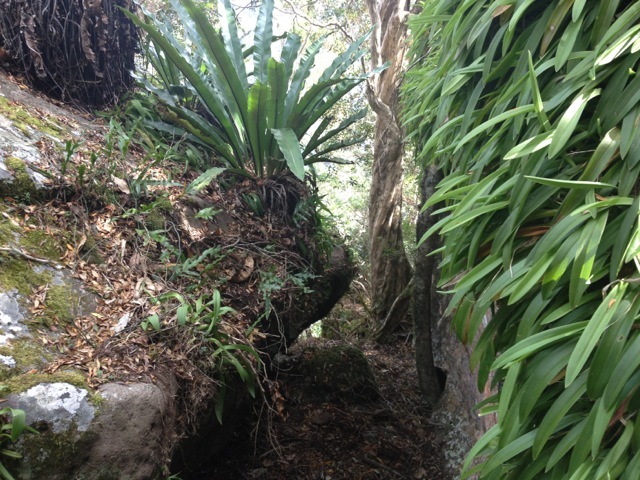 The climb down was fairly straightforward and on arriving back at the tin arrow, we again located the main trail. We followed it back and discovered where we had lost the trail. We arrived back at the vehicles as the sun began to set and drove back to Aratula hotel for the obligatory post hike beer. Overall, while we started late and lost the trail going in, we found the wreck and got out before sunset. A great adventure and an intense hike with a good bunch of people. 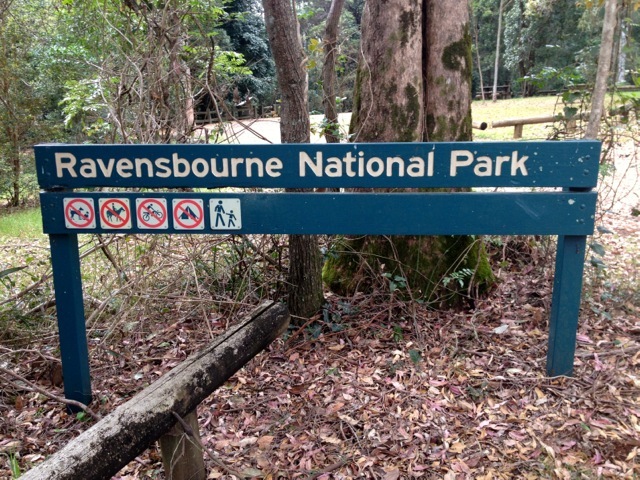 Ravensbourne National Park is a small park only a handful of kilometres from Crows Nest National Park. The weekend I was here it threatened rain, but I still intended to walk as many trails as I could. 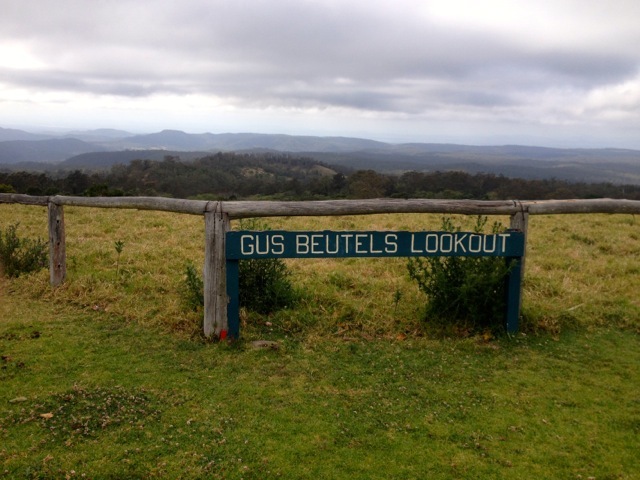 With the threat of rain I headed up to Gus Beutels Lookout. Cedar Block is a very short walk through the rain forest and served as a warm up for the day. I guess if I had to write a description, I would say… ‘there are trees and then it ends’. Warmer after the brief walk, I headed down the road to the beginning of the next walk. 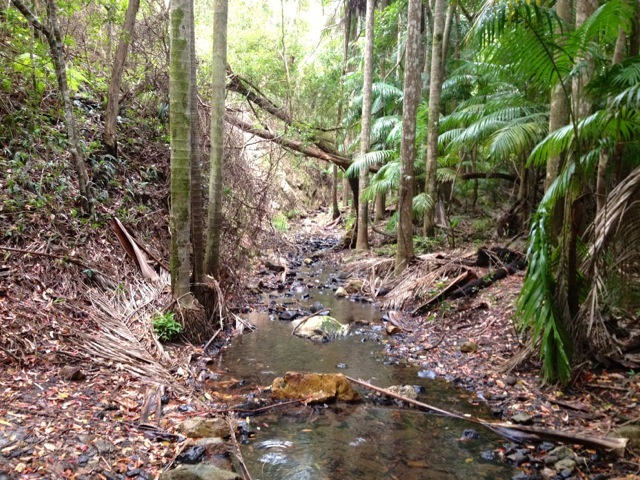 Rainforest, Palm Creek and Buaraba Creek Circuits. 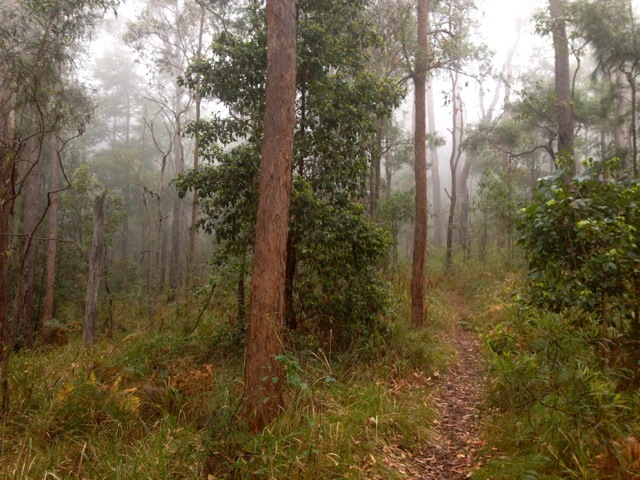 While these three circuits are separate hikes, the Buaraba Creek Circuit traverses both of the others before heading off track and into the forest. Off Track, that doesn’t sound like me? Never. 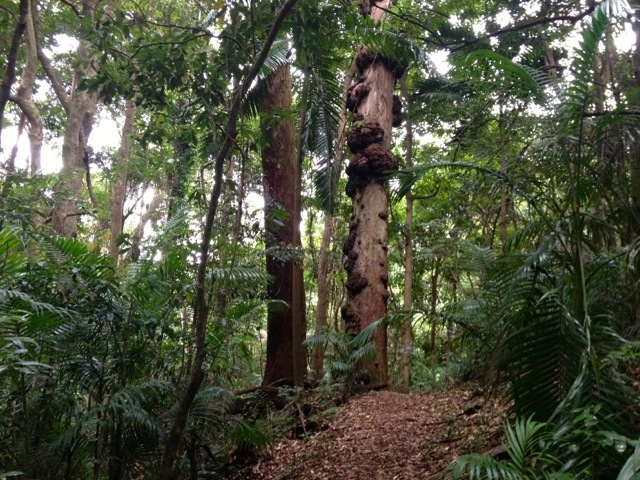 I headed out from the car park along the trail and into the trees. It was not long before I came to the beginning of the rain forest circuit to the right, so I climbed the steps and headed off around it. While it was a nice walk, all those tree-like things really got in the way of any kind of a view. After about 30 minutes I arrived back at the main trail and continued on. It was not long before I came to the Palm Creek Circuit. I headed along this trail and guess what? Trees. While I like walking in the forest, I do find it a little boring. I prefer rocky ridges and mountains for the challenges and the views. But often, hidden away in these forests are cool things, like waterfalls, creeks and caves. 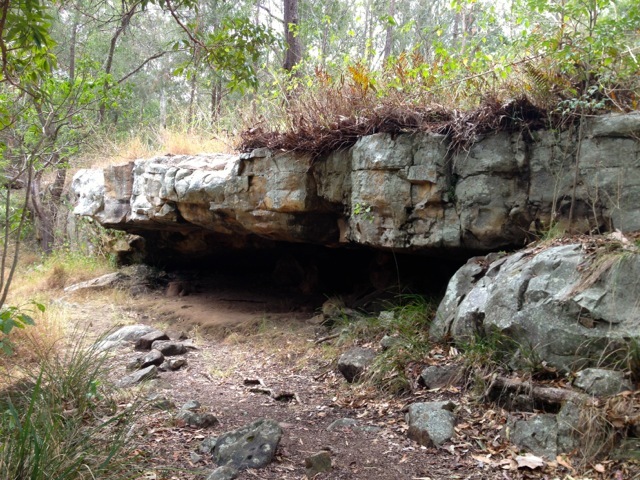 And that’s what I found at the end of the Palm Creek Circuit, a series of low caves. 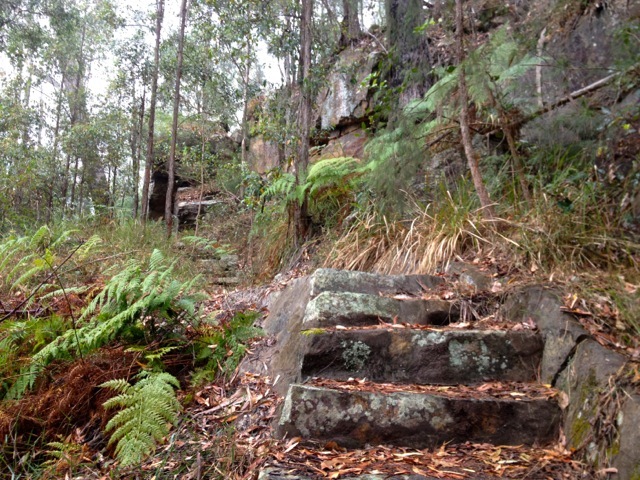 Beyond the caves an ungraded track continued – the Buaraba Creek Circuit. The trail soon turned into a dirt road that headed further into the National Park. The road slowly climbed towards something, although it was hard to tell exactly what. At a crossroads I turned north to another junction, where the path descended steeply towards the creek. At the bottom, I took a break. On the other side, I climbed a steep rocky hill until it too reached a junction and I headed back downhill. For most of the walk, I had seen Lantana along the side of the track, but here it started to encroach upon the trail. I fought through some of it as I followed a lesser walked track. But after a fair distance – and only a few scratches – I decided I had gone too far and decided to climb down a thin trail towards the creek. Somewhere along the other side of the creek there was a graded track leading back to the other circuits, I just had to find it. It was about then that it began to rain – only lightly at first, but slowly gaining momentum. Thankfully I’d brought my jacket and a bag cover. Off trail hiking in the rain is dangerous; rocks and dirt get slippery and I did end up on my arse a couple of times. I worked my way along the creek slowly and carefully, crossing back and forth I eventually came to a grove of palms and soon after the steps I was looking for. 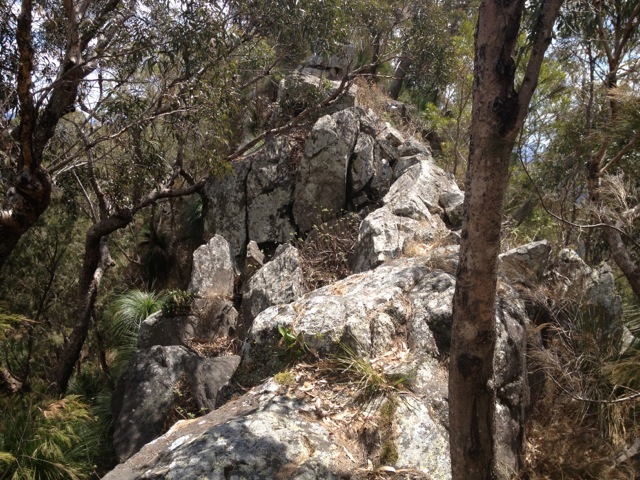 At the top of the steps I found a rocky ridge line. Yay for rocks! The graded track continued ahead of me as the rain grew heavier. And what happens when it rains in the rainforest? Mist. The forest took on a whole different and very beautiful appearance. In the rain, I quick marched for about three kilometres back to the car park and dry clothing. Then I was off to the caravan park for the night and a hot shower. Today it was back to the usual beautiful Queensland weather with no signs of rain. 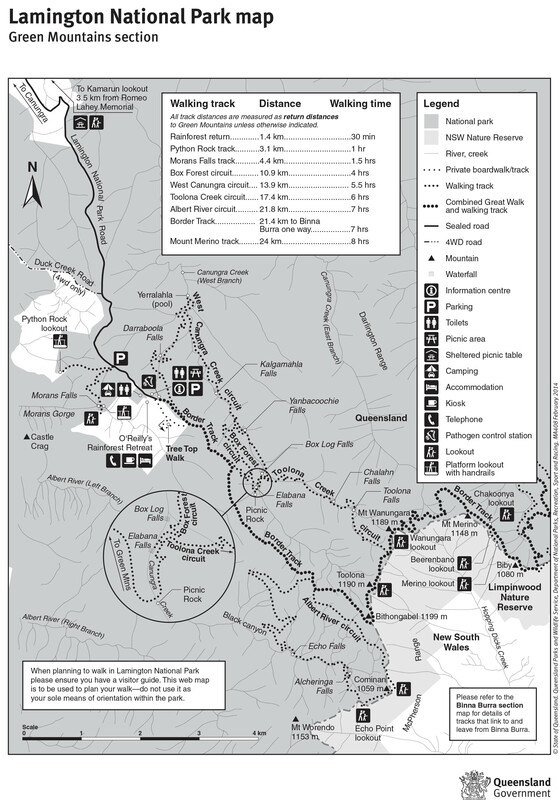 While yesterday I did the official trails, today I am going to do a trail only found in the book: Take a walk in SE Queensland. Because it’s not an official hike, finding the Mt Perseverance Circuit became the biggest issue of the day and the entrance is not clearly marked. After driving along gravel roads for a while, I did eventually find it. It’s near Lot 20. Ignore the old ‘keep out’ sign which near it as it relates to the paddock next to it. 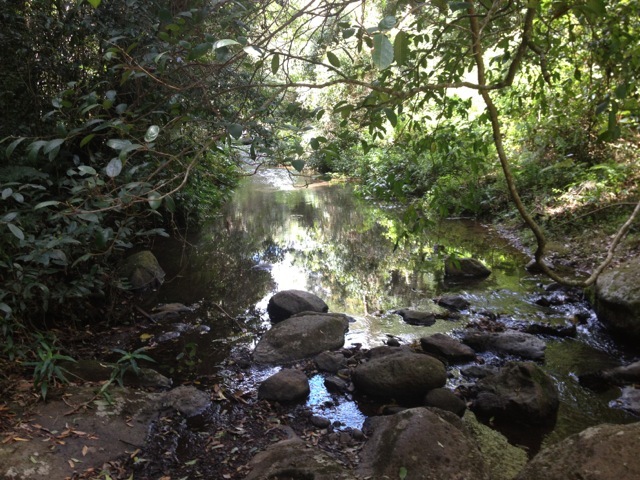 The trail for the entire hike is a wide dirt track and is an easy grade through the rainforest for 7.5km. About half way in, the dirt road climbs to Mt Perseverance. 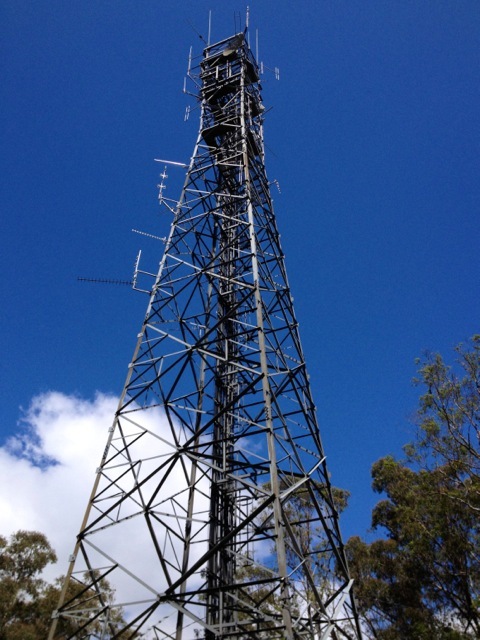 It’s not a hard climb and at the end there is a fire tower, but it’s a little anti-climactic as the tower is fenced off and the views are pretty sparse. I stopped for a break before continuing with the circuit. After another 45 minutes I returned to my van. Over, a good stroll, but not a very exciting walk.